The VENICE and VENICE 4K ingest and playout platform will be demonstrated at the Rhode & Schwarz exhibit. Many new Rohde & Schwarz solutions to be introduced at the 2016 NAB Show in Las Vegas incorporate systems with innovative functions to enhance post production and broadcast workflows. The company will also demonstrate its test setup for ATSC 3.0 transmission. At the 2016 NAB Show, Rohde & Schwarz will present its product portfolio under the banner "Every frame counts." From ingest and mastering to encoding and monitoring to broadcasting and T&M equipment, solutions from Rohde & Schwarz on display at the 2016 NAB Show offer a high resolution such as 4K, the HDR color space or different transmission standards. A new generation of the R&S CLIPSTER mastering station has been optimized as an all-in-one solution for mastering and deliverables of premium content, with more flexibility, quality and efficiency to help service providers expand their portfolio. The efficiency of the R&S CLIPSTER mastering station now allows playout of uncompressed 4K content with 120p (HFR). In conjunction with enhanced IMF J2K profiles for HDR, the R&S CLIPSTER provides content creators with higher resolutions, frame rates and larger color space. The R&S CLIPSTER proves once again its technological leadership and remains the unrivaled reference in the market when it comes to IMF. The R&S VENICE ingest and playout platform meets the requirements of modern live and studio productions and TV operators. The 4K version (R&S VENICE 4K) also features the same flexibility in operation and integration, offering production and TV studios enhanced 4K and UHD-1 efficiency and highest picture quality. At the same time, the interoperability is maintained and the HD workflows continue to remain simple. Rohde & Schwarz storage solutions also offer exceptional performance. With an unrivaled storage density of 60 Tbytes, they offer large, secure storage in the smallest space, meeting the most demanding requirements of post-production and broadcast customers. At the 2016 NAB Show, Rohde & Schwarz will showcase a test setup for ATSC 3.0 with the R&S BTC broadcast test center and the R&S FSV signal and spectrum analyzer. The ATSC 3.0 signal generated by the R&S BTC will be demodulated by the spectrum analyzer and displayed in real time. With this technological setup, Rohde & Schwarz underlines its expertise in OFDM signal generation for another complex transmission standard, which is also integrated in the R&S Tx9 broadcasting transmitter generation. 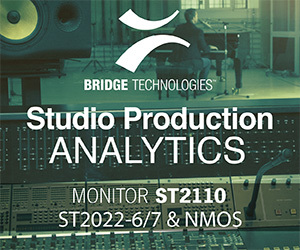 As a reference signal generator, the R&S BTC offers analysis functions and automated tests for audio, video and multimedia applications as well as transmission simulations. That makes it indispensable in establishing new standards. It has excellent technical characteristics and a modular, flexible design. As a high-end signal generator, it produces RF signals for the most important and current broadcasting standards worldwide.